Young dogs grow old! Buddy Guy the famous bluesguitar master has become 77 years today. To honor this legend A Black Bull Blues blues blog for buddy. What I like about the Chicago representative is the youth in his voice and music. In contrast to Muddy Waters or Howlin’Wolf with whom Buddy played together since the fifties is that buddy always kept a kind of youth in his voice. For exemple Slop Around or First time I Met The Blues. 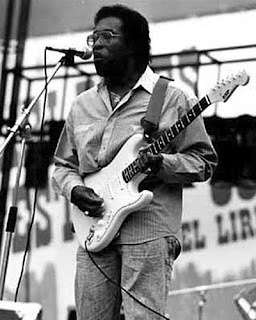 Buddy Guy (born George Guy, July 30, 1936 in Lettsworth, Louisiana) is an American blues music and rock music guitarist, as well as a singer. Known as an inspiration to Jimi Hendrix and other 1960s blues and rock legends, Guy is considered as an important proponent of chicago blues made famous by Muddy Waters and Howlin’ Wolf. He has influenced both widely known and local blues guitarists. My father once gave me a blues record super blues band. It contains music of Muddy Waters, Howlin´ Wolf and Bo Diddley. He Told me the guy that plays Bass is also very good. I didn´t knew who Willy dixon was, but it wasn´t Willy it was Buddy Guy. Buddy Guy did not play bass on every track, but i´ve been told that on some songs buddy grabbed that bassguitar. Guy grew up in Louisiana where he learned to play guitar. In the early 1950s he began performing with bands in Baton Rouge. Soon after moving to Chicago in 1957, Guy fell under the influence of “Mighty”Muddy Waters. In 1958 he won a record contract with Artistic Records after beating the West Side guitarists Magic Sam and Otis Rush in a “Head Cutting Contest” at the Blue Flame Club. Soon afterwards he recorded for the Cobra label. Another story ´bout buddy. A friend wen´t to the North Sea Jazz Festival in Rotterdam the Netherlands. Quitte funny thing most times. But that particular year it was buddy who made the show. Buddy Was fantastic, walk through the audience, let ecerybody rock and made impression with his guitar style. How my friend discribed it “ A religious experience”.